Putting the pretty in your patio may be a bit puzzling for some homeowners. But with these 5 easy and creative patio ideas, you can instantly get a pretty patio without the fuss. If you feel that sticking to one patio surface will make your outdoors look dull, then match the vibrancy of your outdoors with an interesting mosaic. It’ll be easier if you already have the habit of collecting different rocks and stones to put in your mosaic. If a mosaic looks too abstract, then another alternative design idea for your patio are rock flowers. Simply arranging them in a flower design by your patio makes up for a no-maintenance, frills-free design that still catches the eye of a passerby. If you’ve got wood lying around, why not use this as a patio surface material instead. Use it as a faux bridge of sorts over a dry stream and you’ve got a landscaping feature at no cost. What’s more is that, even as the wood slowly merges itself with the earth, it’ll give your garden a rustic chic look. Pick smooth stones to partially bury and serve as steps outdoors. Not only does it encourage exploration, you’ll also be able to lessen your need for ambient lights when you paint it with a luminescent paint that glows after dark. Stick a few other stones in some nooks and crannies and you’ll be able to recreate a clandestine haven for fairies and other mystical creatures. Glow-in-the-dark stones do provide light. However, one thing they do not provide is warmth. Your outdoors may look inviting but without warmth, it’ll simply be a nice view to look out at during chilly nights. 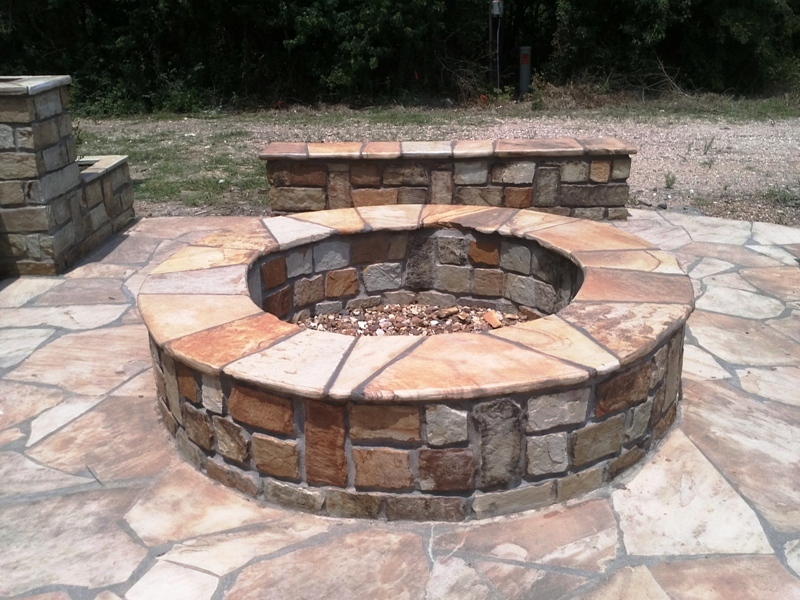 Put a fire pit in a convenient place near your outdoor seating area and make it welcoming even in the most unforgiving cold nights. Your patio need not look like a stereotypical one. By trying one or two of these easy and creative patio ideas, you can transform your patio into a pretty place for you to pander and wander in. Having a hard time deciding which hardscape to install for your patio? Let us help you with the key facts for each of these patio materials. A natural paver that easily provides an elegant look to your patio, it is classic yet expensive. It’s a heavy sedimentary rock with a light surface and comes in a variety of colors. One of the great things about a limestone surface is that it can easily be cleaned and maintained with water. It also doesn’t have to be sealed. However, one should take note that limestone are not great with acid, a little bit expensive and heavy. If you want to make your patio look like a Parisian courtyard, bricks are the way to go. Bricks are usually made with clay and also comes in different color even if the most usual color is red. One great thing about bricks is that you can easily create a visual detail through its brick pattern. It’s easily maintained through vinegar solutions that easily kill weeds and insects. Durable, affordable and can easily be installed, it’s not that hard to see why concrete pavers are a favorite with home owners. It can easily be molded to look anywhere from bricks to barn planks. However, with its porous characteristic, concrete pavers are not recommended in hot climates. It can also easily crack due to high temperatures or extremely cold ones. The following are tips to help you achieve the landscaping design for your home without breaking the bank. Before embarking on your landscaping plan, do your research well. Find out about the plans that can save you some money and how to utilize them. See if you can find professionals and material vendors who do a good job at a low fee. Research about mistakes that people make during landscaping and avoid them in advance. Get free advice from newspapers, online sites, magazines and any other sources and be fully equipped with information. Before making any purchases, make sure that you have a concrete plan of what you want to achieve. Study the landscape types, draw up a design idea and create a tentative budget. Make sure that you design a landscape that will work for you when it is done. When you know what you want, you waste less money. Sometimes DIYs can be cheap but when done blindly they lead to big losses. Consult a professional to check your soil, drainage, and terrain as well as weather conditions so that you can be advised on what is best for your landscape. This will save you from buying expensive projects that will not work for you. Most people like enjoying discount stores, economies of scale and cheap bargains that make you feel like you’re spending less. However, in landscaping, not all cheap bargains are good for you. Some cheap bargains may cost you more in the future. Make wise decisions when choosing materials, designers and the options that you make. Go with choices that will save you money on installation, maintenance, and long-term use. 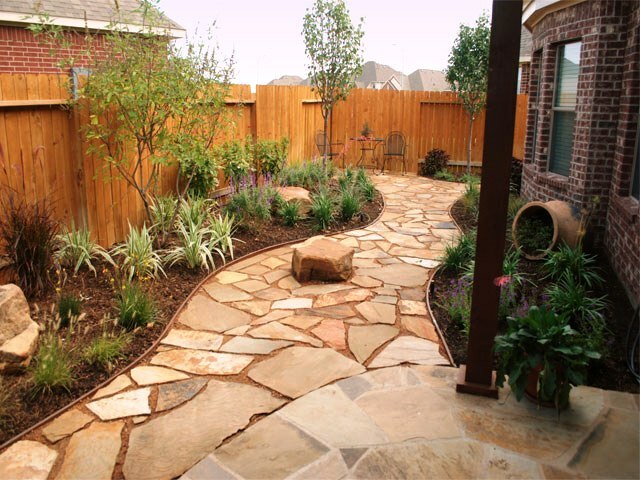 The good thing with landscaping is that you can make it a gradual project. Do not strain to do it all in one day. Divide your project into workable and affordable phases and complete one at a time. Evaluate your progress as you go, and it will reduce the financial strain. You can time your purchases such that you buy items and services during the off peak season. Building a pool during summer will cost you more than building one during the other seasons. The same case applies when buying lumber for outdoor landscaping. Buy trees, shrubs, perennials, and soil late in the season. Newly released materials cost more than when you buy them later when the supply is higher. If you buy your landscaping materials from hardware stores, designer landscaping stores and other high-end sources, you will spend more money. You can buy materials from alternative sources such as botanical gardens, arboretum centers, neighbors, friends, and relatives. Some city parks offer free compost, mulch, and other materials. If you need cheap bricks and stones, you can go to a demolition site and get them for a small fee or for free. Pavers are fast becoming one of the most adopted landscaping styles for outdoor walkways and pavements. This is because pavers are easy to install, easy to maintain, and they are durable. Pavers not only improve the beauty of your outdoors, they function well under pressure and harsh weather. Installing pavers require the right skills to produce a flawless and smooth pavement finish. If you find that your pavers seem uneven, the problem lies at the foundation on which you are installing them. The solution would be to use a compactor to stabilize the land before you install the pavers. Sand and clay behave differently in different weather. Sometimes they create depressions in the ground during dry weather or soak up water and swell up during wet weather. Make sure that you get advice from your contractor on how to best treat your soil. The gravel base underneath the edge is susceptible to harsh weather and erosion, causing some of the bricks at the end to fall off and disappear. If this happens, the solution is to install filter fabric under the base of the sides to make them stick firmly as well as reduce the erosion that makes bricks disappear. You can have a successful paver installation with everything in place but then in time a section of them slowly forms a depression. The solution to this is to compact any place that has been recently dug up. If you remove a tree stump before installation, fill up the space and compact it before installation. You can repair it by pulling them out and adding a bed of compacted soil to bring them to the right level. If you do not have any form of restraint at the edge to create a neat finish, the pavers will end up looking like they are falling off the edge. This causes weak points, and the pavers start coming off one by one. Use a PVC edge restraint to keep the edge bricks in line. Water logging causes soaking which leads to breakage. If pavers are holding water, the solution is to fix your drainage. Check if you are using the correct pitch when installing the pavers. If not, reinstall them with a pitch that can help them to drain easily. When installing pavers, you should make sure that they fall on the same level so that they can form a tight and compact interlocking grip. If not, some of them sink or tip making uneven patterns. Add more sand under the ones that have tipped and reinstall them. Use a compactor to bring them all to the same level. If your pavers are cracking and moving out of place, check the pressure that you are putting on them. The root of this problem includes heavy vehicles, farm machinery, roots, and others. It would be amazing to have butterflies, birds, and different types of wildlife in your yard, especially the kind that does not pose any threat to you or your neighbors. It will save you a lot of energy – Native vegetation is at home with the soil, the temperature and the rainfall of your location and growing it will be easy. Endemic vegetation can survive all the seasons in Texas, and you will hardly need to irrigate or fertilize them to enhance their growth. Furthermore, native vegetation is pest and disease resistant, meaning that taking care of the vegetation will not demand much effort from you. Non-native vegetation can easily get diseases and die out, or takes too much work to sustain. Non-native vegetation can be poisonous to local vegetation – Plants that are not native to your area may be invasive and in most cases can pose a threat to the local vegetation. This poison might be because of the plant’s self-defense mechanism, growth patterns, and struggle for survival in their new environment. Non-native plants can cause diseases to other plants or animals that are not used to sharing the same space with them, or they might even prove to be harmful to human beings. Native vegetation will not become invasive – As opposed to other plants that spread uncontrollably and demand too much effort to maintain, native plants are part of the ecosystem and operate with checks and balances that keep vegetation under control. Furthermore, the vegetation attracts animals and other helpful microorganisms, making them an all-round favorite for the environment. Their root system enriches the soil through enhancing percolation, reducing runoff, and improving the quality of the soil. Native plants are sustainable – Environmental sustainability is a key issue when it comes to thinking of future generations. The earth had established a system where particular plants grow in particular areas while others thrive someplace else. Growing native plants in your lawn makes it possible for the environment to replenish itself and possibly start to reverse the adverse effects of the gradually changing climate. Native plants enhance children’s games – Most people make use of the native vegetation to create a play area for their children. Kids love to play with nature, climb trees, hang out in tree houses, or roll on the grass just for fun. Native vegetation will handle such activities without endangering it, or harming the health of the children. Native vegetation is interesting in all aspects – You can come across trees, shrubs and flowers of different shapes, colors and sizes growing naturally, and this diversity can be points of interest in your lawn or garden. Many of these flora have interesting ways of dealing with the cold winters as well as with the hot summers, and they all have unique growth patterns and pollination procedures.